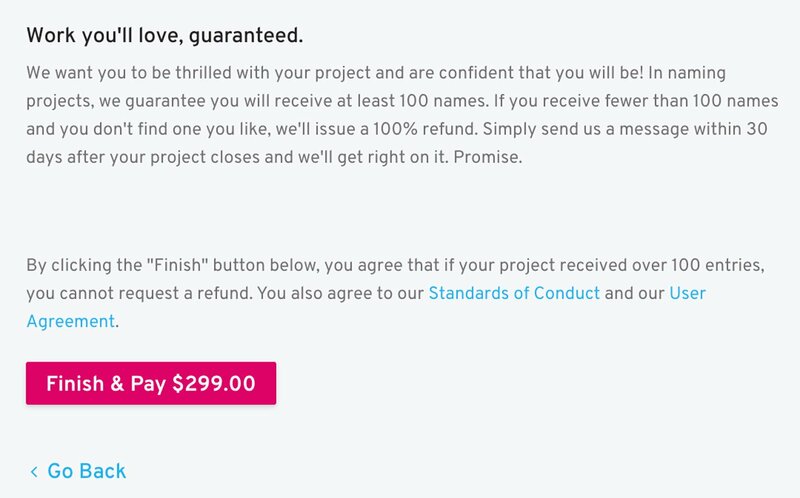 Why is the guarantee in naming projects different? The guarantee in naming projects is different from design projects because once a name has been submitted, it’s hard to “un-ring the bell.” We need to protect the intellectual property of our creative community and this is one way we can do so. Ultimately, naming projects are an exercise in brainstorming and an opportunity for clients to get a wide variety of ideas from a lot of people. The key to success is to be engaged! Work with the namers who are heading in the right direction. Give them feedback and encouragement. If you find that your project isn't headed in the right direction, post an update to your brief with feedback for all of the participating Creatives.